Protecting your ozone equipment from back flowing water is a cost-effective and straightforward way of ensuring up-time and problem-free operations of an ozone installation. The Primozone® BFP is an intelligent solution with automatic control of both water detection and shut-off. Accidental backflow of water that enters an ozone generator may cause significant damage to the ozone reactors and power supplies and consequently result in downtime and significant costs. Thanks to its electrical detection system the Primozone® BFP has a swift response time and is very reliable. At 3 bars working pressure, it is guaranteed to shut-off immediately upon detection of water. 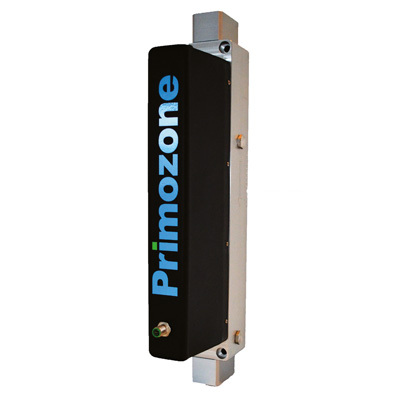 The Primozone BFP is designed to be wholly integrated with any ozone solution. This thanks to its capacity to be enabled either via the ozone generator or a control system and its ability to shut off the complete system automatically when being triggered. The Primozone® BFP is designed for minimum maintenance and safe operations; it includes built-in drainage for quick restart after being triggered. The backflow protector is sized for gas flows of up to 350 l/min (740 ft3/h) and will suit most ozone installations. The Primozone® BFP is built for seamless integration with any Primozone ozone generator and easy integration with ozone solutions from other manufacturers.